SENS PowerCab - Complete DC System / DC UPS includes charger, battery, DC distribution. Ships fully assembled and ready to install. 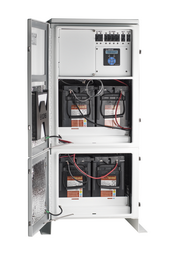 SENS DC PowerCab™ 120 is a complete DC power system / DC UPS in a cabinet, factory-integrated and ready to install. Because PowerCab ships fully assembled, it can radically cut DC system installation time, cost, and risk. It is suitable for virtually any indoor application or load requiring non-stop DC power. PowerCab 120 is available in 24, 48, 120 and 240-volt configurations. Options include an expansion cabinet, supplemental load center, low voltage disconnect, and inverter. Power Cab is a non-stop DC power system designed to deliver uninterruptible DC power to critical loads. PowerCab includes a DC power supply / charger, storage battery, and DC load center. How is it different from other DC system solutions? SENS PowerCab is the first utility/industrial type DC power system that is fully factory assembled and ready to install. Until now, most DC power systems were supplied as either as component parts – e.g. charger, battery, and DC panel board or as a “console”. In each case, extensive installation labor is required. Not with PowerCab. How Does PowerCab differ from DC system that is assembled on site? With an on-site system (purchased like an a la carte meal), the on-site installer needs to assemble battery racks, install and wire battery cells, install the charger and distribution panel and connect it all together with electrical conduit. In contrast, SENS PowerCab was engineered at the factory, and arrives fully assembled, ready to use. Installers don’t need to decide where and how to mount different system components or waste time looking for missing parts or hardware. This cuts total time for installation, reduces labor cost and gives a more predictable “in service” date. Is PowerCab just another name for “console”? No. PowerCab offers much more than the outdated “consoles” that contain charger and battery. In a “console”, the installer still has to install and connect battery cells on site. In contrast, the battery and battery jumpers are factory-installed in PowerCab. PowerCab also includes a DC distribution panel, already installed and pre-wired – ready for your load connections. It looks more expensive than just buying a battery, charger and distribution panel? Why should I pay more? Capital cost of the hardware is only a small portion of the total acquisition cost of the DC power system. Other costs include engineering labor, purchasing labor, installation labor and after-sale responsiveness. Some users have found that because of the reduction in engineering and installation labor, PowerCab is the lowest cost solution compared with either “build your own” DC systems or consoles. So, exactly how do I save money by buying PowerCab? Less engineering labor – because its physical size is easy to understand and well documented. This contrasts with “build your own” systems, where the exact location of battery and charger aren’t fully known until the installer starts to work. Single point of contact: You issue only one PO for a PowerCab. Dealing with just one supplier can save hundreds of dollars in administrative costs. Faster to install: In “build your own” systems, the installer never really knows what’s needed to install or connect system elements until he starts the job. He also needs to assemble a battery rack, and install and wire the batteries together. With PowerCab, all system interconnects are pre-designed and built by SENS inside the cabinet, under controlled conditions. Reduced risk of costly job-site injuries: PowerCab is easier and safer to install. Installing batteries on a rack is heavy, dangerous work because battery terminals are always live. Less safety risk means fewer workplace injuries, and a more productive work force. How can you ship the system with batteries installed? Won’t they get damaged? The cabinet is specially designed, tested and packaged for shipment with batteries installed. The VRLA batteries are firmly secured to prevent movement during transport. And should batteries move a small amount relative to each other, specially built battery jumpers flex to prevent stress on battery posts. How is PowerCab easier to engineer into a project? PowerCab’s precise dimensions allow CAD operators to fit the DC system into any installation as a single cubic shape. In contrast, “build your own” systems require multiple shapes to represent each part. Build your own system also require planning for electrical conduit connections between each battery, charger and distribution panel. This typically takes more time and consumes more total space than is required for PowerCab. How is PowerCab easier to install in my factory or on the job site? PowerCab is moved into place as a single unit. All parts needed for the system are installed and checked in our factory. This “single source” solution saves time by eliminating last-minute searches for parts, hardware or conduit to interconnect the system elements. Why is PowerCab safer than other systems? In PowerCab, batteries are factory installed. This eliminates the heavy and dangerous work of lifting batteries onto the battery rack and connecting them together. PowerCab keeps users safely away from dangerous battery terminals – behind a steel door. Most “build your own” systems either cover battery terminals with flimsy plastic covers or, even worse, provide no safety covering at all. And, unlike competing solutions, the complete PowerCab system is C-UL listed, which significantly reduces the risk of local AHJ inspections delaying project completion. Are PowerCab systems rated NEMA 1, or NEMA 3R for outdoor use? The standard C-UL listed PowerCab is rated NEMA 1 for indoor use. The NEMA 3R option is rated for outdoor use, but is not UL listed. How does PowerCab reduce schedule risk? Design: Engineers know exactly how much PowerCab consumes – and so can quickly decide where to fit PowerCab onto their CAD drawings. Purchasing: Buyers only need to cut one PO, and deal with one supplier. Any schedule concerns can be focused on one supplier, rather than worrying about three or four suppliers. Installation: PowerCab comes fully assembled. Other systems, in contrast, require assembly. In case of missing or incorrectly parts the on-site assembler must stop work, identify the missing part, contact the manufacturer and wait for the part to show up. In some cases this can take weeks. In all cases it is an expensive waste of time that can put on-time completion of large projects in jeopardy. After-sale service: Installation or service technicians focus on just one company to get results. Finger pointing between suppliers is greatly reduced because SENS owns the responsibility of supply a complete, working system. How much space does PowerCab take up? PowerCab is 30.5” wide x 31.5” deep x 78.8” high. The exact space consumed by the system is understood, and can be planned for ahead of time. This is not the case with “build your own” DC systems. How much clearance is necessary around PowerCab? No clearance is required in back or on the sides. PowerCab employs convection cooling through the front door and top of the cabinet. Because of this, the back and sides can be mounted flush with walls or other equipment. PowerCab does have an optional expansion load center that mounts on the exterior of its left side; in this case, SENS recommends at least 36 inches of clearance on the left side. I usually like to use flooded batteries. Why should I consider the VRLA battery you install in PowerCab? Compared with flooded batteries, VRLA technology requires less space and maintenance, does not require an electrolyte containment system and does not require special battery room ventilation. SENS uses only the highest quality U.S. – made VRLA batteries. Top suppliers have improved design and manufacturing processes significantly in the past 10-15 years, making our VRLA batteries much more reliable than those available in the 1990′s. SENS’ EnerGenius IQ charger is temperature compensated, a feature that helps provide optimal charging and extends battery life. The IQ also includes an on-board battery check that validates battery integrity to provide early warning when the battery can no longer support the connected system load. What is the rating of the DC load breakers? PowerCab’s battery and DC load breakers are UL 489 listed at 14,000 AIC (amps interrupting current) at 125 volts DC. This is substantially higher than any other compact circuit breaker on the market. Why is it important to have high AIC DC breakers? High amp interrupting current ratings are vital in battery applications where available short-circuit currents are high. High AIC ratings mean that the breaker can safely interrupt short circuits involving a battery. In contrast, breakers that are not UL listed for DC, or that have low AIC ratings, could fail to open or even explode when attempting to break battery short circuit current. What type of wire is used in PowerCab? Type SIS wire is used for charger / battery / load center interconnects. SIS wiring is available as an option in the charger. Is PowerCab screened to prevent entry of rodents, snakes, etc.? What else does PowerCab include?